You are now in ro4 after having such a great run. How do you feel? The reality of it hasn’t hit yet. Advancing to ro4 in my first time in Code S is a whole new experience to me. Initially, I just wanted to see how far I would go but now that I’m so close to the finals, I can really see how all my hard work has paid off. How did you feel after your 4 gate was held in Set 1? I actually debated whether I should use the build. I even talked to Jinro for a long time whether I should. In Set 1, I was supposed to trick my opponent into thinking that I took my natural but failed to prevent his scouting. Honestly, I was just doing all I could while thinking I had already lost. You played considerably better starting with Set 2. You seemed to get warmed up. I played like I usually do. Taking expansions didn’t prove to be as easy as I wanted it to be which was unnerving but otherwise, the match turned out well just like in practice. You stayed in Code A for a long time. What’s the secret to the sudden explosion of skill? There’s really no secret, rather a bit of luck and hard work. I worked so hard I got stressed out before every match. The consistent hard work is finally bearing fruit. I still get nervous a fair bit but once I get into the match and get warmed up, I calm down quickly. You were seen taking Cheong Sim Hwan (T/N: a herbal medicine for calming the nerves) before the match. Do you still get very nervous? I’ve never taken Cheon Sim Hwan in foreign tournaments. They don’t have it overseas and I’ve never felt the need for it. However, weirdly, I get really nervous in Korea. I get depressed when I don’t play as well as I can due to nerves so I take it in case it helps even a little bit. 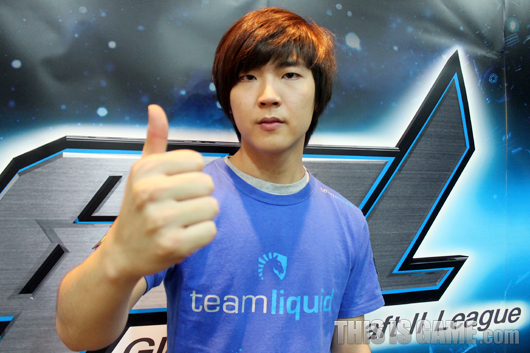 I hate to teamkill but I hope Taeja makes it so at least one Liquid member makes the finals for sure. Protoss is on a roll at the moment. The same can be said for this season of GSL so what do you think about the Protoss OP theory? Maybe a bit strong but I don’t think it’s at the point of OP. I think the better player wins. You face Terrans and Protosses only for the rest of the GSL. Will that help you get to the finals? It’s too bad that there are no more Zergs (T/N: LOL, you’re kinda the reason they all fell in ro16, Hero) I feel for the Zerg fans out there. I find PvP boring so if I make it to the finals, I hope I get to face IMMVP. You could give in to nerves in ro4. The atmosphere is quite different. I’ll know when I get there. Actually, even today I felt a bit anxious. I think I’ll have to take Cheong Sim Hwan in ro4 too. There were many foreign fans at the studio today. You seem to have more foreign fans than other players. Well, I am part of a foreign team and do well overseas so it’s understandable. Team Liquid is participating in the next GSTL. They’ll be relying on you as their ace. We don’t have a deep roster so that could prove troublesome but if we come together, we’ll be solid competition for the other teams. The fact that TL is participating as its own team is very meaningful. I hope to do well in GSTL. Supernova and I both practised hard so I feel sorry about rolling over him a little. We made a promise that whoever wins would go onto win the championship so I’ll make sure to win the whole thing for Supernova. I hope Supernova wins next season (laugh). NHSHJoon helped extensively with practice. He helped me saying he wanted to be mentioned in an interview (laugh). He’s a bit disappointed about falling down to Code B but I hope he doesn’t give up and works hard. I also want to thank, Jjakji, forgg, Puma, Sculp, Jinro, Tree. Oz gave saw me before ro8 and gave me the build for Metropolis so I want to thank him too. I want thank the sponsors: TheLittleAppFacotry, Twitch TV, Razer. I also want to thank oGstheWind. I want to thank captain Cezanne and all my teammates. I really want say thanks to my parents. They told me they would attend the finals no matter what if I made it so I want to do well for them. Lastly, I want to thank SlayerSEve for her helpful words (T/N: Hero, you sly dog. And OMG HOW MANY PEOPLE MUST YOU THANK). What are your thoughts on your first time in ro4? I didn’t even think this possible at the start of the season. It’s like I’m dreaming. You had a 3:0 victory today. Were you confident? I was a little nervous since I had a 50% win rate in practice. The thought of possible defeat kept me on my toes. Were you more relaxed after your victory in Set 1? Yes. My opponent played as I expected him to. How on earth do you deal with the Squirtle timing. It’s rare to see Terran not pressure even once. I go for such a timing. It’s better if they just stay in their base. Your prowess in army engagements was impressive in Set 2. It’s disadvantageous if the Terran defends at the natural. That’s how the map is built. I knew there was a high chance of breaking through if I caught the Terran in that position. Set 3 boiled down to an elimination race. My build was thrown off. I wanted to hide my robotics facility and do an immortal all in but the reaper ruined it. I think Taeja was a bit bewildered too. You gave away a free colossus. Wasn’t that a Colossal mistake? It was. It was a lapse in concentration. I was worried about a possible medivac drop at 7 o’clock so I spammed move command leading to the colossus straying away. Your forcefield play at 7 o’clock was amazing. If I didn’t hold there, I would have lost. And as we both attacked out mains, if Taeja had taken out all my observers, I also would have lost. Do you feel like people’s evaluation of you has definitely changed this season? Always Code A? A player who used to be Code A calibre at best doing so well has elicited a favourable response from the fans. People are jokingly accusing me of taking a performance enhancing drug and asking whether the drug came from Genius (laugh). What’s the secret to your explosion in skill? During practice, I honestly felt that I was good enough to be in Code S. However, I lost confidence after losing in broadcasted matches. This season, I regained my confidence in GSTL and with the second place at IPL4. Afterwards, the games are turning out well. Your ro4 opponent is Hero. Isn’t your PvP formidable? To be honest, I don’t see it as a walk over. I think such an attitude is offensive to Hero. Still, I don’t think I’ll lose. I’ve always though highly of Hero so this is a great opportunity to take him on. You are in a position to teamkill Parting possibly. 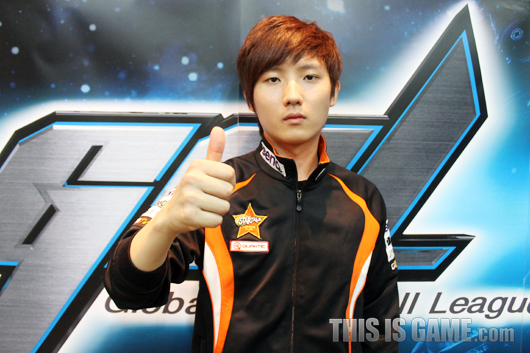 Since Parting is on fire lately, he will make the finals. IMMVP is good too but Parting’s unstoppable. Parting and I will probably make the finals. If it does come to that, I will win as it’s a PvP. We don’t practice against each other lately but back when we did, I won more than him. A PvP in ro4 hasn’t happened for a long time. Protoss really is strong lately. I don’t think Protoss is favoured in PvZ. I also think the better player wins in PvT. Didn’t Hero say so as well? I happen to agree. Also, I think Protoss players in general have gotten better. I want to thank the sponsors: BenQ, Zowie Gear and Red Bull. There’s been a cold breakout at the training house so everyone’s having a hard time, so I want to say thanks to : Hack, Sound and especially Bomber who helped until 4 am this morning. I also want to thank Ace, Tiger and Coach Kim for their advice. You are a god among men. Thanks as always. I still do not understand how it is possible to translate so fast. lmao Hero. Congrats on his win. I hope he wins GSL! I want Hero or Mvp to win it, if its actually Parting vs. Squirtle finals, I think it would be pretty lame T_T. Then you're wasting time translating articles when you could be making money off the stock market or saving peoples' lives. I find PvP boring so if I make it to the finals, I hope I get face IMMVP. Lol yeah right, Hero just doesn't want a coinflip and would rather play someone he already beat 2-0. Dear Team Liquid please give storywriter a community star and/or translator icon. So, you are from the future. Where is Squirtle's interview then? You had about 11 minutes to post it already.